Disclosure: Sample product was offered. No monetary compensation was received. Looking for something different to add to your decor? AdoramaPix helps people turn their digital photographs from abstract computer files into beautiful keepsakes designed to last a lifetime. Their contemporary metal prints capture memories in rich color and vibrant detail. Because your images are infused right into the metal, and not painted on the surface, their metal prints are extremely durable. Not only will your metal image be water AND weather proof, but scratch resistant as well. Yup, you can even clean it with glass cleaner. Your memories deserve to live in true, archival luxury with AdoramaPix metal prints. 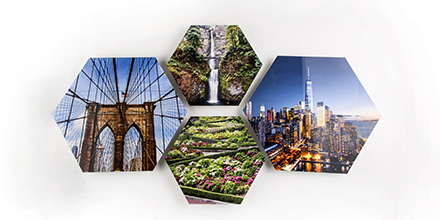 Save 25% off Hexagon #Metal Prints! Use promo code: PXHEXMTL25 expires June 15th!